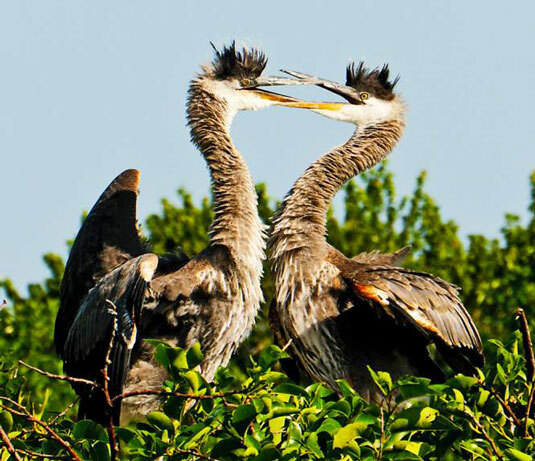 Nikon D5200: How Many Pixels Are Enough? Pixels are the little square tiles from which all digital images are made. The Nikon D5200 lets you set image size, which determines the number of pixels captured in an image. You can see some pixels close up in the right image in this figure, which shows a greatly magnified view of the eye area in the left image. Pixel is short for picture element. The number of pixels in an image is referred to as resolution. You can define resolution either in terms of the pixel dimensions — the number of horizontal pixels and vertical pixels — or total resolution, which you get by multiplying those two values. This number is usually stated in megapixels, or MP for short, with one megapixel equal to 1 million pixels. However, if you select Raw (NEF) as your file format, all images are captured at the Large setting. You can vary the resolution only when choosing JPEG as the file format. Print size: Pixel count determines the size at which you can produce a high-quality print. If you don’t have enough pixels, your prints may exhibit pixelation defects or worse, you may be able to see the individual pixels, as in the right example in this figure. Depending on your photo printer, you typically need anywhere from 200 to 300 pixels per linear inch, or ppi, of the print. To produce an 8 x 10 print at 200 ppi, for example, you need a pixel count of 1600 x 2000, or about 3.2 megapixels. Even though many photo-editing programs enable you to add pixels to an existing image, doing so isn’t a good idea. Adding pixels — known as upsampling — doesn’t enable you to successfully enlarge your photo. In fact, upsampling typically makes matters worse. Screen display size: Resolution doesn’t affect the quality of images viewed on a monitor, television, or other screen device the way it does for printed photos. Instead, resolution determines the size at which the image appears. This issue is one of the most misunderstood aspects of digital photography — just know that you need way fewer pixels for onscreen photos than you do for printed photos. In fact, even the Small resolution setting on your camera creates a picture too big to be viewed in its entirety in many e-mail programs. File size: Every additional pixel increases the amount of data required to create a digital picture file. So a higher-resolution image has a larger file size than a low-resolution image. You can store fewer images on your memory card, on your computer’s hard drive, and on removable storage media such as DVDs. The camera needs more time to process and store the image data on the memory card after you press the shutter button. This extra time can hamper fast-action shooting. When you share photos online, larger files take longer to upload and download. When you edit your photos in your photo software, your computer needs more resources and time to process large files. As you can see, resolution is a bit of a sticky wicket. What if you aren’t sure how large you want to print your images? What if you want to print your photos and share them online? Always shoot at a resolution suitable for print. You then can create a low-resolution copy of the image in your photo editor for use online. In fact, your camera offers a built-in resizing option. Again, you can’t go in the opposite direction, adding pixels to a low-resolution original in your photo editor to create a good, large print. 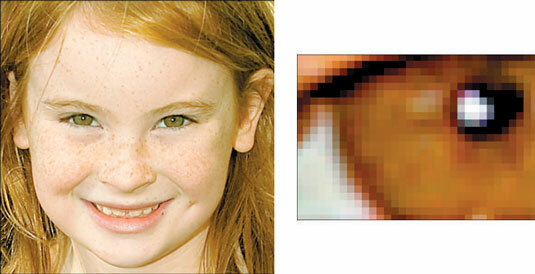 Even with the very best software, adding pixels doesn’t improve the print quality of a low-resolution image. For everyday images, Medium is a good choice. The Large setting is overkill for most casual shooting, which means that you’re creating huge files for no good reason. Keep in mind that even at the Small setting, your pixel count (2992 x 2000) gives you enough resolution to produce an 8 x 10-inch print at 200 ppi. Choose Large for an image that you plan to crop, print very large, or both. The benefit of maxing out resolution is that you have the flexibility to crop your photo and still generate a decent-sized print of the remaining image. These two figures offer an example. 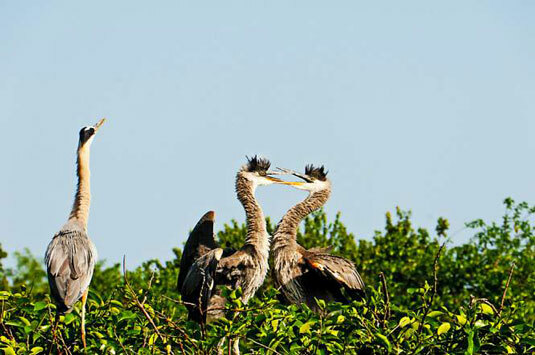 When shooting this photograph, the photographer couldn’t get close enough to fill the frame with the main interest — the two juvenile herons at the center of the scene. But because the resolution was cranked up to Large, he could later crop the shot to the composition you see in the second figure and still produce a great print. In fact, you could print the cropped image at a much larger size than fits here. Reduce resolution if shooting speed is paramount. If you’re shooting action and the shot-to-shot capture time is slower than you want — that is, the camera takes too long after you take one shot before it lets you take another — dialing down the resolution may help.